Heavy metal band X Japan has gone through many painful experiences including the deaths of two former members but its rock ‘n roll spirit will survive, said the group’s leader, drummer and pianist Yoshiki Hayashi. The act has been on a world tour in 2011 and the first leg of its Asia tour will be Seoul on Friday at the Olympic Park Gymnasium. It is the first time that the band is coming for a concert in Korea, after the cancellation of the Korea tour which had been scheduled for March 2009. The death of former X Japan bassist Taiji in July was a shock to all members of the band but the act decided to continue the world tour. “X Japan has had a lot of drama including the breakup before, and we lost one of our dearest members Hide. A few months ago, we lost another member Taiji. 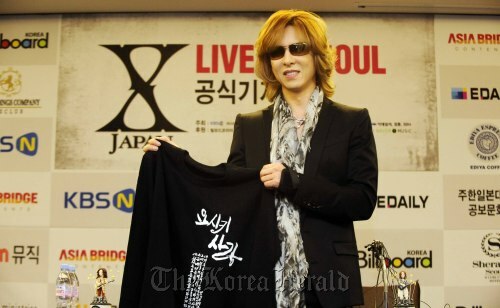 It was not easy to keep going,” Yoshiki told reporters in Seoul on Wednesday. “Music is very strong. We went though a lot of pain but nothing can stop us. Nothing is impossible,” he said, using expletives quite often in his soft and girly voice. Debuting in 1985 with a single “I’ll Kill You,” X Japan ― currently consisting of Yoshiki, guitarist Pata, bassist Heath, guitarist and violinist Sugizo and vocalist Toshi ― quickly rose to stardom. By wearing heavy makeup and sporting heavily gelled spiked hair but shouting melodramatic lyrics and melodies, the act pioneered so-called “visual rock” in Japan and created a huge sensation among young Japanese in the ‘80s. In the early ‘90s in Korea when Japanese cultural content was not officially open to the general public, X Japan’s studio album “Blue Blood” was estimated to have sold more than 500,000 copies underground, the organizer said. The rock group disbanded in 1997 and its former member Hide died in 1998, but the group re-united in 2007. “When we lost Hide, I couldn’t do anything. I was home for months and didn’t even open the door. But during the tour around the world, I thought it was better to keep going and be strong, play music to support each other,” Yoshiki said. About the upcoming Seoul concert, Yoshiki did not reveal the setlist but promised that the group will please the loyal Korean fans. “When we perform, we put our entire energy. I’m pretty sure that you’ll experience something you’ve never experienced before,” the 46-year-old rocker said. He said he loves K-pop and hear a lot of K-pop songs in Los Angeles where he has been frequenting for more than 15 years. After X Japan attended the Summer Sonic Festival in Tokyo a few months ago, he felt very sorry to miss the chance to see Girls’ Generation, he said. The “2011 X Japan Live in Seoul” will be held at the Olympic Park Gymnasium at 8 p.m. on Oct. 28. Tickets range from 77,000 won to 187,000 won. For more information, visit www.xjapankorea.com.